For the past 33 years, I have been engaged in a love affair. It all started at a time when I was young, impressionable...innocent. I had toys, many toys, including Star Wars, Marvel and DC Super Heroes in numerous variations, Shogun Warriors and the Six Million Dollar Man, but it was the Micronauts toy line that won my heart above all others. I can still picture the night that my mom took me with her to a department store with a name that I cannot remember (K-Mart? Clicks?). The store was closing per the announcement bellowed over the intercom and a few of the lights had been turned off to give customers the hint that they needed to get the hell out. 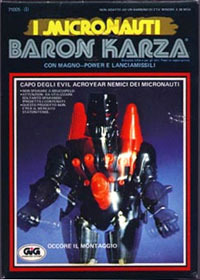 My brother and I were at the toy aisle, looking with boredom through the usual displays of toys that we did not care about, when I spotted one lone box on the shelf for the Micronauts toy, Baron Karza. I already owned Galactic Defender, Space Glider, Acroyear and a Time Traveler, but Baron Karza was the elusive prize that I had been dying to find. With an unprecedented amount of begging and pleading and promises to do anything my mother wished, I left with the toy in hand and I could not have been happier. A year later, Mego, the toy company that released the Micronauts toy line, teamed with Marvel Comics to release The Micronauts: They Came From Inner Space written by Bill Mantlo and drawn by Michael Golden and I had no idea that this had happened. 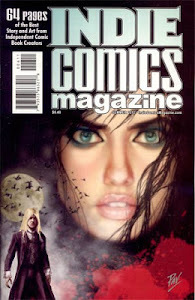 I was only eight years old, and knew nothing of monthly schedules or release dates and only knew about the comic books that showed up at the news stand in the mall. 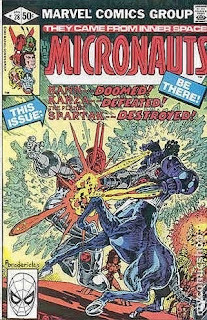 I nearly lost my mind when I found The Micronauts issue number two for thirty five cents. Commander Arcturus Rann (Space Glider) who has just returned from his 1000 year journey aboard his ship the Endeavor after exploring the depths of the Microverse. During that time, he remained in a state of suspended animation, and accompanied only by his roboid companion, Biotron, he explored the tiny universe as a mental projection. 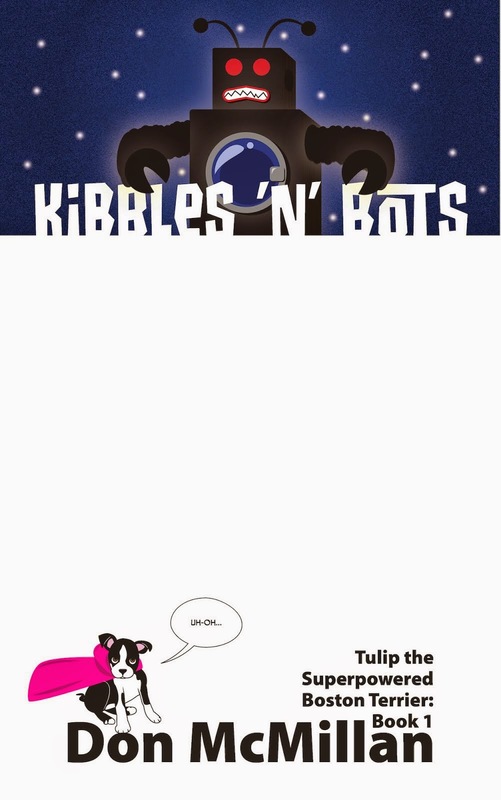 He returns to Homeworld only to find that the diabolical Baron Karza has survived the 1000 years and has taken over the planet that Arcturus used to call home. Princess Mari (Marionette) the former royalty of Homeworld has barely escaped the clutches of Baron Karza, but her brother, Prince Argon has been captured. Mari vows to free her brother and to mobilize what remains of the decimated rebellion. She is accompanied by her roboid, Microtron. Bug, of the Insectivorids from the red treed planet, Kaliklak. 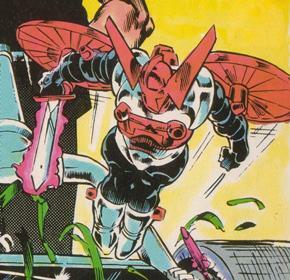 Bug was and still is my favorite of The Micronauts. 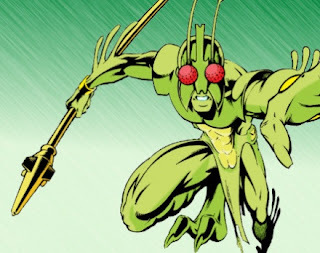 A green-skinned humanoid insect. A thief by trade, but a fearsome warrior in his own right, Bug is the trickster of the bunch and oftentimes used as comic relief, but in a way that is not condescending to the reader. The diabolical Baron Karza is the foe for much of this amazing space opera, and the focal point for much of this disarmingly heavy series. 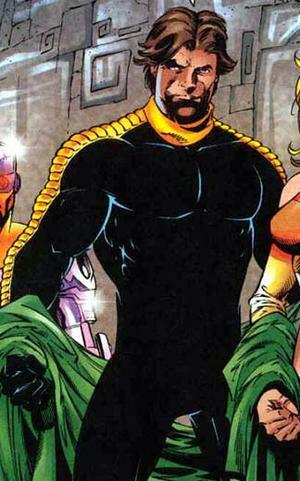 Karza was once Homeworld's Chief Scientist until the point that he murdered Dallan and Sepsis Rann, the parents of Arcturus and rulers at that time of Homeworld. A genius in biological engineering, Karza has become something much more than human and through the promise of eternal life for the inhabitants of Homeworld, he has seized control of the Microverse in the cold steel grip of his ebony gauntlet. With an unending supply of body parts from The Body Banks, the maniacal dictator sets loose his endless hordes of Dog Soldiers to capture and destroy The Micronauts once and for all. 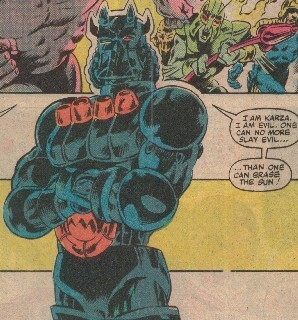 The Micronauts contains a near unstoppable evil that threatens the universe, love, loss, hope, betrayal, death, rebirth, redemption and victory at an unbearable cost, and for a comic book series based off of a toy line, The Micronauts had it all. 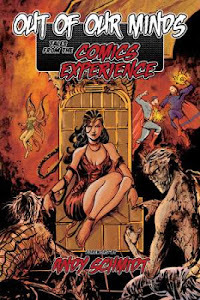 The series ran for 59 issues, had a four issue limited-series with the X-Men, a couple of annuals, and a revival series called Micronauts: The New Voyages that ran for 20 issues, which was an interesting and very different series in and of itself. For a nine year old boy, this series was incredibly dark and dire, but I loved every bit of it. It took me years to find all of the back issues that I missed at the magazine stand and various other places that I was lucky enough to find various issues, but I was dealt a major blow, when Marvel Comics announced that The Micronauts would no longer be offered to newsstands or grocery stores starting with issue number 38, and would only sold by the direct market; comic book stores. It would be a year and a half before I discovered the now-gone local Andromeda Bookstore and I once again embarked on a quest for all of the missing issues, which I quickly snatched up. Just last year, I discovered bookbinding for individual comic books and I had all of my The Micronauts comics bound into three giant tomes that now rest prominently on my bookshelf and begging for me to reread them. After writing this blog entry, it is on! Time to reread one of my all-time favorite series ever created. With any luck, I will someday get that Bug action figure that I have been waiting most of my life for. 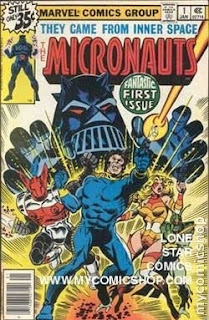 *NOTE - Hasbro just acquired all of the rights to the Micronauts toy line, and Hasbro is fairly tight with Marvel Comics. There are talks of the old toys being revived, and new ones being released, as well as interest from J.J. Abrams to create a Micronauts movie. Hot damn, I can only hope and pray that this happens soon. With any luck, there will be new Micronauts comics on the horizon, reissues of the original series and an amazing movie that spawns a new franchise. Fingers crossed.